What can I reuse or recycle to make knitting/crochet blocking pads? If you follow my simple living blog The Really Good Life, you’ll know that I’ve been crocheting recently. I can’t stand to touch yarn in the warmer months but now it’s cold outside, the hook is pretty much glued to my hand. I’m currently crocheting a tank top thing to wear as a woolly layer over long-sleeved t-shirts and it’s going to need blocking. 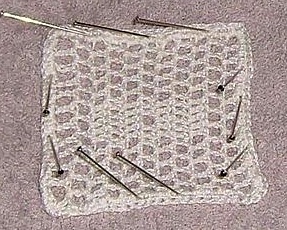 For non-crafters, blocking is a finishing technique used for handmade items using natural fibres, which involves gently stretching the dampened garment into its correct shape and pinning it in place to let it dry. It’s not essential but it can improve the hang/drape of the finished item and needs to be done, to a slightly lesser extent, whenever the item is washed (which is why some items have “reshape while wet” on the label). Purpose-bought blocking mats can be bought – usually rubber or foam mats that allow the item to dry without developing damp mould, are flexible to use (often interlinking so you can use a small piece or a large sheet, depending on your need) and easy to store. Crafters tend to plough all their hard-earned money into precious yarn though so are good at making their own or finding cheaper alternatives: I’ve heard of people using swim floats, garden-kneelers or the like from the £/$ store, of others using clean carpet tiles and others still using cardboard in a pillowcase or under a light towel. They’re all good ideas but I wondered if the Recycle This community, which I know contains a lot of crafty people, had any other ideas. What do you use for blocking? Have you made or repurposed anything for the task? Any ideas or advice will be gratefully received! We’re having a bit of a book-themed week here on Recycle This and I thought I’d share with you some of my favourite reusing/recycling ideas – inspiration, how-tos and thing to buy if you’re not the crafty type yourself. As I mentioned yesterday when talking about damaged books, it’s easier to revamp or reuse hardback books for practical purposes because they’re that bit tougher. 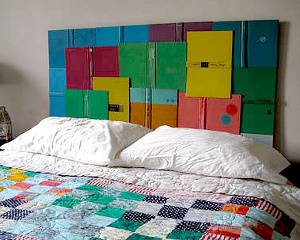 They can be used for everything from statement bed headboards to “floating book” shelves. On a smaller scale, they can be turned into purses/handbags, clocks, self-supporting photo frames, notebooks, iPhone charging units – and even table legs. 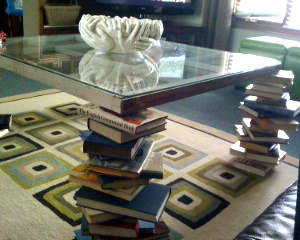 @AlishaAnnn told us about the table below on Twitter yesterday: “Table legs from recycled books with a metal rod through. They are sturdy and spin. Old barn window on top.” Great recycling! Other people prefer to use the pages of old books: either as art in themselves or as canvas for printing/painting, to decorate greeting cards, envelopes, super retro bunting or, on more elaborately, this fantastic paper wreath. And BellwethersDB on Twitter had a good few ideas for using the pages too: “Tear out the pages and print vintage images on them and frame them! So pretty”, “Tear the pages and mod podge them onto old ornaments, add glitter and a ribbon. Voila! A “new” ornament!” and “Paper beads! Then paint them and string them on ribbon.” @_jennifergrace_ also tweeted us to say she’d used book pages as the background for welcome cards & name badges for a hen weekend, to make her own ideas notebook and as part of a bigger art project. 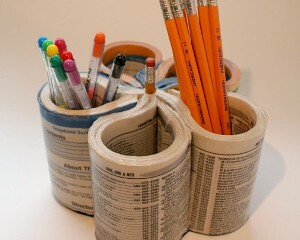 And speaking of pages, this desk tidy is made with a phone book but any oversized book – old annuals or craft books – would would just as well. 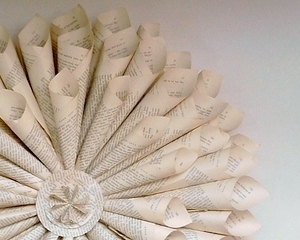 Finally, Alice in Blogland sent us a link to this fab recycling books for booklovers story, such amazingly intricate work! 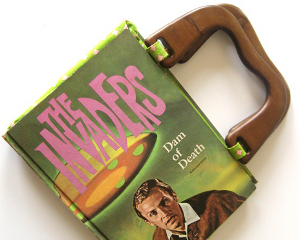 Have you seen any other great example of reusing, recycling or upcycling of old or damaged books? If so, let us know in the comments! It’s been a while since I’ve done a “links round-up” post about some of the things that I’ve been emailed or spotted around the greater internet recently so … here goes! 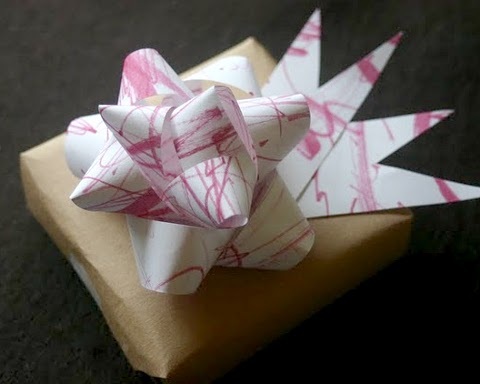 With the major gift giving time of the year looming in the near-distance, I love this idea of reusing colourful children’s pictures to make gift bows instead of using generic plastic ones. Of course the same idea can be applied to any old paper – as the tutorial shows black-on-white newspaper text looks pretty cool too. I’m always a sucker for stuff made with drinks cans but these flowers are rather cute – I especially like the painted ones. Tinplategirl emailed recently her new tutorials site about working with tinplate – the smooth heavier-weight metal from various large tins & cans. The site includes a number of free videos introducing the craft – where to find the materials and how to work with them – and how-to PDFs for making all sorts of things (some free, some costing up to $9.95). A great resource for people wanting to move on from working with the more malleable drinks can metal. And speaking of large tins, this tiered unit made from old biscuit/chocolate tins has been around for a while now but I thought it was worth mentioning because it’s a lot of fun and useful. Oh, and if you haven’t seen it, do check out WeUpcycle.com, which started as a 30 day/30 upcycled things project but is now a wider collection of upcycling ideas. No how-tos but lots of inspiring, pretty pictures. Have you seen any fun or interesting reusing or recycling projects recently? Or have you got anything you’d like to show off of your own creation? Do leave a comment below! 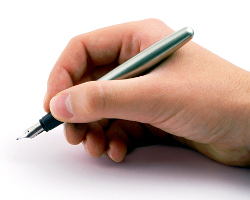 What can I reuse or recycle to be an eco-friendly pen-pal? I have a bit of a dilemma. I’m from Minnesota USA, and I have a pen pal in California. 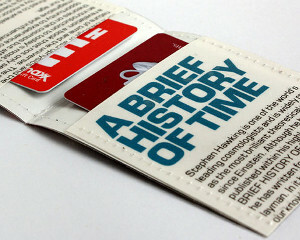 We love sending “snail mail” to each other in this day of somewhat impersonal emails/Facebook. While it’s very fun, I’ve recently been thinking about the waste. I keep the cards she sends me, but is there a way to purchase/make more eco friendly cards and envelopes? Thanks! I’ve been thinking about going back to snail mail for keeping in contact with some people recently (to cut down my computer time) so this is a very well timed question! You certainly can buy cards and envelopes made by upcycling old paper – old packaging, old maps, old books – all sorts of stuff. If you search for “recycled envelopes” on Etsy, you’ll see the range of stuff available (including ones from friend of Recycle This, SwirlyArts.) You could make your own if you’re that way inclined too. Look around your home/office to see what you can reuse as writing paper – on my desk in front of me right now, I could use the white-side of some pretty-designed security envelopes, a brown paper bag or if I was feeling more delicate than I generally am, an old sewing pattern. I’d probably cut them neatly with a guillotine or straight scissors, but scrapbookers/papercrafters with the tools on hand could jazz them up with wavy scissors or punch designs. One pre-cut idea might be to use old blurry photos – the type that aren’t suitable for the photo album but look pleasantly abstract by themselves. Another idea might be to use cards that will serve a different purpose once they arrive with your message – the most obvious idea is picking ones that are so pretty that they can be framed as art, either individually or if you fancy something bigger & bolder and a fun ongoing project, you could make your own large scale design (perhaps by decorating/upcycling card/cardboard packaging) and chop it into card size pieces for gradual reassembly at the other end. More practically, you could find/make a design for recipe cards or dividers for a seed box (or anything your penpal might use for a hobby) – print it on one side of your card/paper and write your message on the back. A finally suggestion/question from me: it is, of course, better to Reduce than reuse or recycle – would it be possible to make a secure reusable envelope/pouch that could be sent back and forth? If it can be made from existing materials all the better – any ideas? Any other suggestions for Mary? 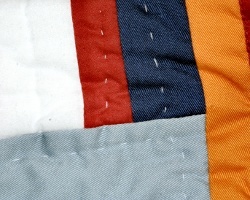 How can I reuse or recycle small pieces of fabric – that isn’t patchwork blankets or tote bags? Any other good ideas for using fabric. I have tons of it and I am getting bored making blankets and tote bags. I want to make something useful. While I’d challenge the insinuation that blankets & tote bags aren’t useful, I do know what she means – we currently have more than enough shopping bags and throw blankets (even with a messy/often soggy dog) so new ideas are always welcome. I’ve seen some lovely pieces of patchwork used for revamping old chairs etc recently – painted woodwork and patchwork seats – and also patchwork cushions, but I’d imagine the latter would quickly become the next blanket/tote bag — a couple is all you need. Individual little bits of fabric could be used for appliqué for upcycling/revamping old clothes, or used for creative repairing. Bunting is also super popular at the moment as an all-year-round decoration as well as at party time. Involving less sewing, jersey/t-shirt material can become reusable washcloths or wipes to replace toilet paper. I’ve also seen lots of fabric wrapped bangles and necklaces recently. And don’t forget rag rugs – I recently saw a cool way to make round ones using a hula hoop but if the fabric pieces aren’t big enough for that, a knotted one might work better.